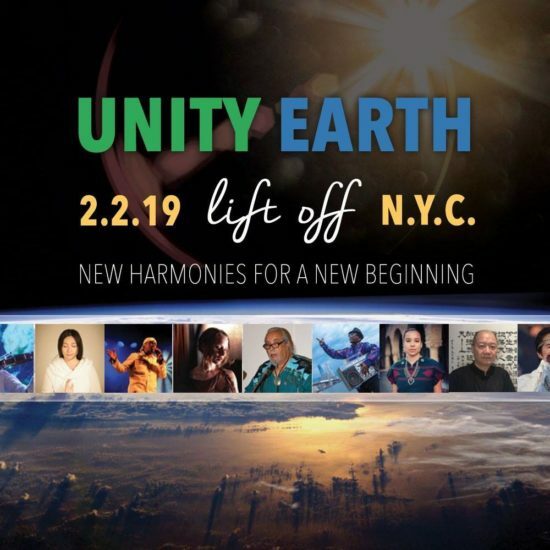 UNITY EARTH: LIFT OFF is a multigenerational, intercultural, interactive concert taking place on February 2, 2019 at the historic United Palace in New York City. This unprecedented celebration and live broadcast will bring together indigenous leaders, musicians, diplomats, artists, scientists, peacemakers, interfaith and faith-based activists, along with guests of all ages. The concert will feature a cast of globally-renowned touring artists including BELLA GAIA, a NASA-powered live concert that blends music, technology, and satellite imagery to illuminate our interconnectedness and turn the stage planetary. International artists include British reggae legend Pato Banton and Chinese meditative chanting artist Mystic Voice. The line-up also features major NYC-based talents including holistic hip-hop legend Akim Funk Buddha (with his dance troupe the Bonsai Lab), Juilliard-trained vocalist Kristin Hoffmann, and indigenous Caribbean (Taino) & Spanish master percussionist William Ruiz. The event will begin with an opening ceremony led by Ramapough-Lunaape Chief Dwaine Perry with visiting indigenous leaders, and Diné musician, poet and activist Lyla June will also perform. It is an honour for us to welcome an array of First Nations leaders including Dwaine Perry, Chief of the Ramapough-Lunaape Nation, Dr. Mindahi Bastida of the Center for Earth Ethics, Hereditary Dakota Chief Phil Lane Jr., as well as Diné poet, musician and activist Lyla June. We are pleased to welcome a delegation from China and Korea including Lixin Chen and Ming Shan, as well as Ambassador Mussie Hailu, Global Envoy of the URI to the African Union. Spiritual advisor, author & host of America Meditating Sister Jenna will be joining us, as will Karenna Gore, Director of the Center for Earth Ethics, and visionary, philosopher and researcher Jean Houston. Also speaking will be Mary Evelyn Tucker and John Grimm, the Executive Producers of Journey of the Universe, and Directors of the Yale University Forum on Religion and Ecology. UNITY EARTH: LIFT OFF is a catalyst for the Global Road to 2020 and its culminating event, the Caravan of Unity Across America. The Road to 2020 is an increasingly public series of events worldwide designed to capture new opportunities for weaving a greater spirit of unity and peaceful coexistence across the Earth. Building on the work of UNITY EARTH’s U Day Festival 2018, which commemorated World Interfaith Harmony Week in Ethiopia at the African Union Commission in February 2018, the UNITY EARTH: LIFT OFF event on February 2nd, 2019 will work to engage and inspire the New York community, NGO representatives to the UN, and the diplomatic corps while introducing the Road to 2020 and Caravan of Unity to an international audience.